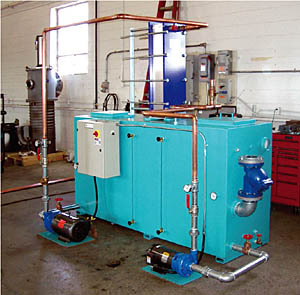 Representative medium-size furnace installation has a small floor-space requirement. There are a number of factors that should be considered in selecting the best furnace equipment for a new heat treating operation. Size – Vacuum furnaces are available in a wide variety of sizes. The initial capital outlay and operating costs are in proportion to size. The furnace chamber must be physically large enough to handle the largest work piece or load being heat treated, plus an allowance for tooling or fixtures. To achieve proper heating and cooling in a vacuum furnace, individual work pieces within a load must be evenly distributed. As a result, the furnace work zone may need to be slightly larger than what might be expected by someone unfamiliar with vacuum heat treating. The furnace manufacturer can review the customer’s heat treating requirements and advise on the most appropriate size and orientation (horizontal, front-loading or vertical, bottom-loading). When selecting a furnace size, some thought should also be given to future processing requirements. It is usually impractical (and sometimes impossible) to enlarge a vacuum furnace if larger heat treating applications develop. Budget: The basic equipment price for most popular smaller and medium sizes of vacuum furnaces will range from $300,000 to $500,000. Additional costs will likely be incurred for site preparation and installation, auxiliary systems, tooling, staffing and others. These additional costs can be in the range of $50,000 to $100,000. Throughput: The amount of work that can be processed in a single furnace load is proportional to the size of the furnace. Typical vacuum heat treating or brazing cycles range in duration from a minimum of about five hours to much longer cycles, many in excess of twelve hours. With allowances for loading and unloading time, only two to three complete heat treating cycles are typically completed in a 24 hour period. Vacuum furnaces (even large models) do not require special foundations. With floor loading rarely exceeding 40 psi, they can be installed on any industrial grade concrete floor. When possible, it is best to locate the furnace against a wall (preferably an outside wall) for easiest routing of utilities and mounting of electrical switchgear. A ceiling height of at least 15 feet is usually required for most medium-size horizontal furnaces, though it is sometimes possible to accommodate lower ceilings. Floor space requirements vary widely with furnace size, but an area of at least 400 ft2 (approximately 20 feet square) would normally be required for a medium-size furnace. 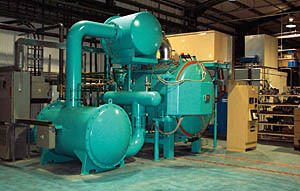 All vacuum furnaces must be connected to supplies of electricity, water (for cooling), quench gas and compressed air. The full load electrical power requirement for smaller and medium size furnaces can range from 300 amps to 800 amps or more (including auxiliary system requirements). The customer is usually required to supply the main electrical disconnect. The furnace manufacturer usually supplies all other switchgear and connections to the main disconnect as part of the installation services. Electricity costs during heat treating will vary depending on the size of the furnace and the type of heat treating being performed. VAC AERO can assist in estimating these costs. If a central cooling water recirculation system is not already in place, it is strongly recommended that an auxiliary cooling system be purchased for the furnace (these systems are available from VAC AERO). The cooling system consists of a reservoir/heat exchanger/pumping package (located inside the building) and an evaporative cooling tower (located outside the building). The cooling tower has a gravity-feed return to the reservoir so must be positioned above the reservoir. Ideally, the cooling tower is positioned on the roof of the building directly above the support wall closest to the reservoir. If this is not practical, the cooling tower can be mounted on a stand on the ground. Water consumption occurs only through evaporative losses and is therefore relatively low. The customer supplies a make-up water line that is connected to the coolant reservoir through a float switch that inlets water only when necessary. All vacuum heat treating processes use “inert” gases for quenching or cooling at the end of the heating portion of the cycle. Nitrogen is by far the most popular quench gas. It is inexpensive and has good cooling properties. Because nitrogen can be slightly reactive with a small number of alloys under certain conditions, some heat treating applications require the use of argon for quenching. Argon is much (about five times) more expensive than nitrogen and has less effective cooling properties, but is totally non-reactive with metals. Helium is gaining popularity as a quench gas. Helium has better cooling properties than both nitrogen and argon but is very expensive and future supplies are somewhat uncertain. It is important to inform the furnace manufacturer about which quench gas or gases will be used because the quench blower in the furnace must be designed to suit the properties of the quench gas. The amount of quench gas used in each heat treating cycle is directly proportional to the size of the furnace chamber and the quenching pressure required. For all but very small furnaces, it is recommended that a permanent liquid bulk supply of quench gas be installed. An industrial bulk gas supplier (such as Air Liquide, BOC Edwards or Praxair) should be consulted for this installation. The bulk supply installation usually involves pouring a concrete pad outside the building to accommodate a liquid gas reservoir tank provided by the gas supplier. Besides the cost of the concrete pad, other charges from the gas supplier will usually include a set-up fee, a monthly rental fee for the reservoir and charges for the amount of gas used each month. VAC AERO will consult with the gas supplier to determine the optimum size for the bulk supply reservoir. The bulk supply is connected to a surge tank located near the furnace. The surge tank is supplied by the furnace manufacturer and is designed to hold enough gas at sufficient pressure to complete one or two quenches. It is usually the customer’s responsibility to prepare all openings in the roof and walls of the building to accommodate vent lines and connections to the cooling tower and bulk gas supply. Roof openings are small, usually less than 18” square, but require a weather-proof cap. A supply of compressed air is required to operate valves and other pneumatic devices on the furnace. The air supply pressure is regulated to between 80 and 100 psig. While this supply should be continuous (even when the furnace is not operating), consumption is very low. Menu screen from PC-based control system. Modern, well-maintained vacuum furnaces do not radiate excessive heat to the surrounding environment or release other serious pollutants. However, the vacuum pumps operate with a continuous noise level approaching 82 dbA and there may be occasional noise spikes slightly above this level when the furnace backfills or the quench blower activates. These spikes are short in duration (usually less than 15 seconds) and would typically occur only a few times in each 24 hour period. Sound-proofing can be added to the system to reduce noise levels, but this is an extra expense. Standard vacuum pumps are oil-lubricated and will emit a small volume of oil mist during the initial stages of evacuating the chamber. The pump exhausts are vented to the outside of the building. If venting this small amount of oil mist is a concern, the pump exhaust can be equipped with a filter at a cost of around $2,000. At the conclusion of each heat treat cycle, the quench gases must be vented from the furnace. An exhaust is connected to the furnace chamber and routed to the outside of the building. The quench gas is non-polluting and can be vented through the exhaust into the outside environment without requiring any special treatment. Due to the length of typical heat treating cycles and in order to generate the best return on the investment in the equipment, heat treating operations are usually run 24 hours per day, often 7 days per week. Fortunately, once loaded, modern vacuum furnaces can be operated in a fully automated mode without an attending technician. There are numerous alarms and interlocks built into the control system that will not allow the furnace to operate in an unsafe condition. A datalogger records all relevant information on operating parameters during each furnace cycle. Some control systems also include a remote access capability that allows for monitoring or regulating the furnace via secure Internet connections. These systems can also be used to activate pagers or dial phone numbers if an alarm condition develops. However, a technician is usually required to manually prepare loads for processing, attach thermocouples and load/unload the furnace. While a single, properly-trained technician can effectively operate and maintain one or two furnaces, safety regulations may require at least two persons per shift. A quality control inspector is usually required at some point in the operation, but may not be needed 24 hours per day. Vacuum brazing applications may involve additional staff. Considerable labour is required to prepare work pieces for some brazing processes. It is generally recommended that a separate, clean and enclosed area be designated for brazing preparation. Any contamination of work piece or braze alloy during the preparation process can produce detrimental results. Other vacuum processing preparation operations sometimes include degreasing or grit blasting, which may not only involve more labour, but also the purchase of additional equipment. Baskets containing parts for heat treating ready for loading into furnace. Components that are to be heat treated must be properly loaded into baskets or onto trays. The baskets or trays are then placed on a grid that rests on the hearth rails of the furnace. Most heat treating tooling is made from heat resistant stainless alloys such as RA330 or Inconel 600. Some grids are manufactured from molybdenum, which is very expensive but particularly well-suited for high temperature service. Carbon plates are gaining popularity as a durable and less expensive approach to heat treating tooling, but care must be taken to insulate the carbon plate from the metallic work piece to prevent eutectic melting. Usually, two sets of tooling are assigned to each vacuum furnace. While one set is in the furnace during heat treating, the second set can be used for preparation of the next load. The initial capital outlay for sufficient tooling to support a medium size furnace can easily reach the range of $10,000 to $20,000. Alloy heat treating tooling also requires periodic maintenance such as straightening or weld repair, which generates additional cost. There are several manufacturers of standard heat treating tooling in cast or welded construction. VAC AERO can provide advice on the best design and available sources for tooling. With a reasonable preventive maintenance program and good operating practices, a vacuum furnace can be depended upon to operate reliably for at least twenty years. Preventive maintenance involves checking oil levels in pumps, inspecting for proper cooling system flow, checking belts and o-ring seals for damage or wear and ensuring the vacuum chamber is free from debris or contamination. The cost for consumables associated with preventive maintenance is relatively low, usually less than $5,000 per year per furnace. For every furnace customer, VAC AERO provides comprehensive training in preventive maintenance and good operating practices. This training should allow the customer to use in-house resources for many maintenance and repair activities. More major maintenance expenses should be anticipated within every five to seven years of operation. The mechanical vacuum pumps may require an overhaul at a cost of $2,000 to $4,000 (depending on the type of pump). 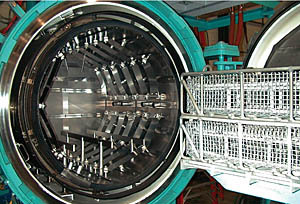 Hot zone repairs may also be necessary (the “hot zone” is the insulated assembly containing the heating elements located within the vacuum chamber). For a smaller or medium size furnace, these repairs can range from $10,000 for a relatively minor restoration to more than $50,000 for a complete re-build. Furnaces used extensively for brazing tend to require more frequent hot zone repairs. Thermocouples are used to control the temperature in the furnace and monitor the temperature of the workload. Control thermocouples (there are typically two per furnace) are usually made from expensive platinum/rhodium wire and can cost as much as $350 each. However, these thermocouples often operate for up to a year before requiring replacement. Workload thermocouples, though slightly less expensive than control thermocouples, are replaced more frequently. The average annual expense for workload thermocouples would typically be in the range of $2,000 to $4,000 per furnace. Most heat treating specifications require that all furnace control and monitoring instruments be calibrated on a regular basis (usually once or twice a year). Most heat treaters use approved subcontractors for calibration services. These services can cost in the range of $2,000 to $3,000 per visit. VAC AERO provides calibration services for all makes of furnace instrumentation. There is an array of decisions to be made when a business assesses the viability of establishing a new heat treating capability. Innovations in furnace design such as hot zone materials, control packages and quenching systems can offer many operating and performance improvements, but will also affect the capital investment. There can be significant costs beyond the price of the furnace equipment that also need to be well understood. From years of experience as both a heat treater and furnace manufacturer, VAC AERO can provide informed answers to cost/value questions affecting these complex business decisions.